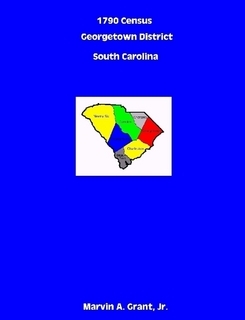 A complete transcription of the 1790 census for Georgetown District South Carolina. This census listed the name of each head of household in the county and further enumerated each family by categories (males 16 and up, males under 16, females.) Free Colored Persons were listed in the "Other" column, and Slaves were listed in the slave column. This was the first census taken for the United States. In 1790 Georgetown District covered a much larger area than today including all of the present day counties of Georgetown, Dillon, Horry, Marion and Williamsburg and about half of present day Florence County. Full transcription from the original 1790 census records. Each entry compared to the 1908 published version and discrepancies found and noted. Each entry cross referenced to the 1800 census and if found in Georgetown or Marion, a notation was made. A map showing Georgetown District as of 1790 showing the county divisions and major waterways. A description of the Parishes (All Saints, Prince Frederick and Prince George) that were used to divide the county. Edition: Third (7 Feb 2008), originally published 2003.